Jonathan the giant tortoise experienced a bath for the first time, at least in recorded history, at the ripe old age of 184. A resident of St. Helena Island in the South Atlantic, Jonathan happens to be the oldest known animal on Earth. His scrub down, administered by veterinarian Joe Hollins and posted on YouTube this week, lasted only about an hour. 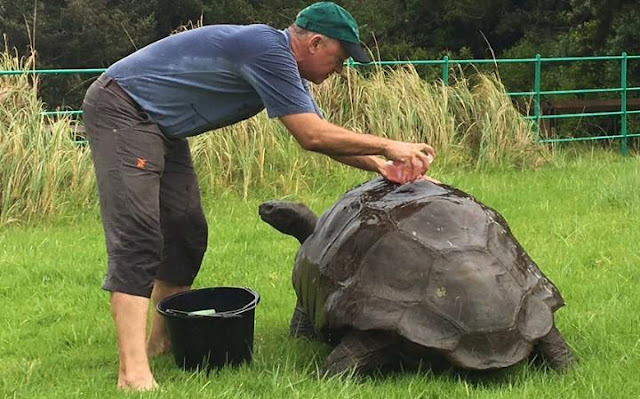 Just a bucket of soapy water, a soft brush, a loofah and one very indifferent tortoise. Giant tortoises are famed for their epic life spans. One named Adwaitya reached 255 before her death at the Calcutta Zoo in 2012. On average, they live around 150 years. Indeed, while Jonathan will continue being the same old giant tortoise — we hope for many more years — it's the man who gave him the bath who seems the most profoundly affected. "What an honor," Hollins says in the video at the scrubbing's conclusion, "to be looking after the oldest living land animal. What an amazing thing." 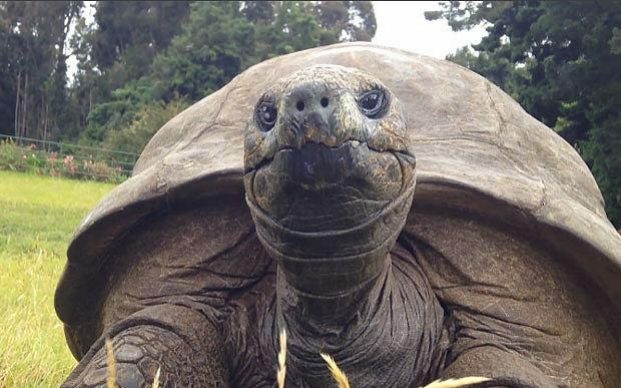 Responses to "World's oldest living animal, 184-year-old tortoise named Jonathan, has first ever bath "
Why did he need a bath? He seemed to be surviving just fine for 184 years, without one. Hope it was good for and not bad, as some things, even dirt, have their purposes! Why did he need a bath? Wouldn't those lumps and bumps stay on in the wild? It didn't look like he enjoyed it any, kept trying to spin around. Oh well, maybe it was one of those "make humans feel good" projects. exactly my thoughts! why did he need a bath?!. This is so symbolic of what is wrong with the world today..... people not connecting, not feeling for the animals at all... doing things from the mind, science and "good intentions"..... this is about his ego not Johnathon. I agree, it did not look as though he enjoyed it. Lighten up people. Stop your scolding. It's only a bath that's all.